So far Tony Kinney has created 9 blog entries. While Trail Lake Lodge offers guests a wide variety of unforgettable Kenai Peninsula adventures, such as whale watching, glacier viewing, and sea kayaking, we fully understand that a salmon or halibut fishing trip is too alluring to pass up. We cooperate with some the best Alaska fishing charters to provide visiting anglers with fully-customized fishing trips in jaw-dropping Resurrection Bay, world-famous Kenai River, and countless other secret honey holes. All of our once-in-a-lifetime Alaska fishing adventures can be combined with any number of activities during your five or seven-day all-inclusive family vacation to The Last Frontier. Surprise the love of your life this year with a well-deserved romantic fishing getaway to breathtaking Moose Pass, located in the heart of Alaska’s Kenai Peninsula! When you choose Trail Lake Lodge for a couples retreat, you’ll always be steps away from potential Alaska fishing adventures. Our picturesque location on beautiful Trail Lake and proximity to the peninsula’s best outdoor adventures make us one of the premier romantic getaways in Alaska. And we’re so much more than just a fishing lodge – we’ve meticulously incorporated many of the area’s best activities into our couples-friendly programs. What separates the very best Alaska fishing adventures from rest of the pack is on-site amenities, nightly accommodations, and daily dining service. Luckily for you, Trail Lake Lodge in breathtaking Moose Pass is home to one of the best restaurants in Alaska. We provide visiting anglers with a hot, hearty breakfast, daily sack lunches, and a diverse dinner menu that satisfies every taste bud and dietary restriction. Whether you’re craving large fillets of beer-battered cod, a juicy half-pound burger, or a fresh, creative salad, Trail Lake Lodge is the place to be every night of the week. Devour these four popular culinary creations when you’re not salmon fishing in Alaska. The Chugach National Forest spans nearly seven million acres in Southcentral Alaska, so, naturally, it’s home to some of the best hiking trails in Alaska. Trail Lake Lodge is widely known its Alaska fishing charters, but we’re actually an adventure-based vacation destination first and foremost. Our Adventure Vacation Packages, of course, also include countless hours of salmon fishing in Alaska. Anglers from across the globe visit Moose Pass, Alaska, for the thrill of reeling in a trophy salmon. As autumn slowly fades into winter here in Moose Pass, Alaska, it’s time to start thinking ahead to next summer’s wedding season. The Kenai Peninsula may not be a world-renowned wedding destination, but that doesn’t mean Trail Lake Lodge hasn’t hosted tear-jerking ceremonies for couples from all across the lower 48 states. Our lakeside resort is also one of the premier wedding ceremony locales on the Kenai Peninsula for Alaskans from Anchorage, Fairbanks, Juneau, and far beyond. Year-round lodges in the Last Frontier are sadly few and far between, but there are plenty of terrific options on the Kenai Peninsula if you look in the right places. 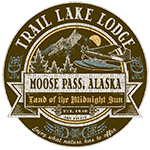 Trail Lake Lodge provides stunning beauty, cozy rooms, hot meals, and never-ending great Alaskan adventure here in Moose Pass, Alaska, making us one of the premier regional choices for family reunions. Whether you’re hoping to fish for delicious salmon, explore Kenai Fjords National Park, or simply gather and relax in the great outdoors, our caring and experienced staff will help plan an unforgettable family reunion that everyone can appreciate. The best aspect of Moose Pass Alaska, the “Land of the Midnight Sun,” is that this natural playground offers so much more than trophy trout, salmon, and halibut. Being located on the stunning shores of Trail Lake at the foothills of the snow-capped Kenai Mountains has its perks. Guests at Trail Lake Lodge are steps away from fishing, hiking, or birdwatching excursions at all times. The Last Frontier is quite literally an outdoor enthusiast’s playground. Trail Lake Lodge is steps from Trail Lakes, overlooking the vast mountainous Chugach National Forest. Our breathtaking slice of Alaskan paradise is always a short expedition from a day filled with wonder and awe-inspiring natural beauty.